While growing up in Curacao, the first Major League team Andrelton Simmons saw on television was the Braves, with center field being patrolled by Andruw Jones—the most notable player in the island's history. Simmons longed to play for the same team as Jones but knew the odds were long, and he attracted little attention from pro teams as a teenager. He did catch the eye of Western Oklahoma State JC head coach Kurt Russell during a recruiting trip, however. The school often brings in players from the Caribbean, and Russell deemed Simmons a perfect fit. Diamondbacks' shortstop Didi Gregorious was Andrelton's double-play partner on Marchena Hardware, a youth team in Curacao, for 10 years. As kids, Simmons and Jurickson Profar played soccer against each other. "I always beat him," Simmons professes. They also pitched to each other on scrub fields with balls made of socks wrapped in tape. At age 16, Andrelton turned down small bonus offers to sign out of Curacao, and that would have spelled the end of any professional baseball hopes if Western Oklahoma State coach Kurt Russell hadn't seen him on a Caribbean scouting trip. In 2010, Andrelton tied for second in the Appalachian League with 18 stolen bases and was the toughest player in the league to strike out, with only one whiff per 19.2 plate appearances. In 2011, the Baseball America Prospect Handbook rated Simmons as the 15th-best prospect in the Braves organization. He moved all the way up to #4 in the Atlanta farm system in the winter before 2012 spring training. In 2011, Simmons led the Carolina League in batting (.311) and plate appearances per strikeout (13.3). And league managers rated him as the circuit's top defensive shortstop, best infield arm, and most exciting player. Andrelton is willing to learn from his critics. He thinks it helps him improve. "I like looking at the negatives a little bit," Simmons said. "I like hearing the criticism a little bit. It drives me." Simmons is mature and understands the game. In March 2013, Andrelton played for the Netherlands in the World Baseball Classic. Andrelton was pleased to learn the Major League Players Alumni Association selected him as the Braves' honoree for 2015's Heart and Hustle Award. This award honors active players who demonstrate a passion for the game of baseball and best embody the values, spirit and tradition of the game. Each team's winner is selected by votes cast from former players who have established relationship with the respective clubs. December 2016: Simmons committed to play for the Netherlands in the 2017 World Baseball Classic. June 2010: The Braves chose Simmons in the second round of the draft, out of Western Oklahoma State Junior College in Altus, Oklahoma. Scout Gerald Turner signed him for a bonus of $522,000. February 20, 2014: Simmons signed a seven-year, $58 million contract extension with the Braves. November 12, 2015: The Braves traded Simmons to the Angels in exchange for pitchers Sean Newcomb and Chris Ellis, veteran infielder Erick Aybar, and cash. Simmons makes real good consistent contact with a short stroke and has some pop to the gaps in his righthanded swing. But he won't hit home runs very often. He is developing a little pull-side power. He very rarely strikes out. He tracks the ball real well at the plate. And he has good bat speed. He has incredible hand-eye coordination. Andrelton's swing is rather long. But he should hit enough to keep his glove in the lineup. He is an aggressive hitter who has good strike zone knowledge. He usually makes something happen during the first three pitches of an at-bat. His hand-eye coordination is so good that he hits what he swings at so much and can still do a lot of things with a bat. In 2014, Simmons played in 146 games and had almost 600 at-bats, but scored only 44 runs. 2015 Improvements: Simmons used a term often thrown around baseball circles to help explain his offensive improvements this season, but it rings true in his case. Simmons’ ability to “stay through the ball” has been key to what is currently his first full Major League season with a batting average of at least .270. It’s a big change from 2014 when he struggled to stay above water at the plate, finishing at .244 with a .286 on-base percentage. His poor offensive numbers stifled his defense by limiting his overall value to the team. Seitzer, hired to bring a contact philosophy to the Braves, has had a positive impact on Simmons. The shortstop is using the coach’s mentality of staying on the ball, working up the middle, limiting actions at the plate and grinding out at-bats. That progress is seen at the plate and in the numbers. The violent swing that often had him stumbling or hitting a knee last season has been cut down in the name of contact, and he has settled for the line drive single more often instead of aiming for the left field bleachers. Simmons has increased his line drive rate by seven percentage points while cutting down his fly ball rate by six points. He’s spraying line drives to all fields rather than violently popping the ball up, and he said he’s noticed fewer ground balls weakly rolled over to third base or shortstop. 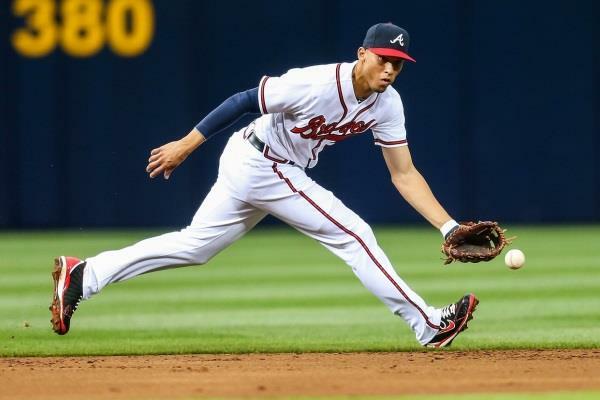 From the day he broke into the big leagues with the Braves in 2012, Andrelton was not just one of the best defensive shortstops in baseball, but one of the best defensive shortstops in baseball history. He was a human highlight reel, finding a new way to drop jaws nationwide seemingly every other day. Sure, he wasn't anything to write home about at the plate. For years, the only thing keeping Simmons from full-blown stardom was his bat—despite a 6-foot-2, 200-pound frame, he hit just 35 homers over his first five seasons, and he'd twice posted on-base percentages under .300. A funny thing has happened over the past few months, though: Simmons has very quietly transformed himself into one of the best hitting shortstops in the game. In 2017, Simmons is on pace to easily break his previous career highs in his slash line. How is he doing it? His walk rate is way up and his ground-ball rate his way down. Simply put, he's seeing the ball and driving it better than he ever has before, allowing him to tap into power we didn't know he had. As of the start of the 2019 season, Simmons's career Major League stats were: .269 batting average, 60 home runs and 924 hits, with 356 RBI in 3,438 at-bats. Andrelton is a superb defensive shortstop—the best in the Braves' organization in 2011 and 2012. And the strongest arm, too. He has real good actions and impressive instincts. He slows the game down and reads the ball off the bat well. "He's the best natural shortstop I've had the opportunity to work with," Braves roving infield instructor Tom Shields once said. "I believe he is the steal of the 2010 draft. He has unbelievable energy, a rifle for an arm, and excellent range. He is as smooth and polished as you'll ever see a guy at shortstop." In 2017, Simmons was rated as the Best Defensive Shortstop in the AL, in a poll by Baseball America for their Best Tools issue in August, 2017. And for the season, Andrelton ranked #1 in DRS (Defensive Runs Saved, with 32) and was among the leaders in fielding percentage, assists, putouts, innings played and range factor. He led all players with a 4.2 defensive WAR reading and holds the highest single-season defensive WAR mark in history, when he registered a 5.4 reading back in 2013. Simmons has a real cannon for an arm, throwing hitters out from deep in the hole. It is rated a 75 or even an 80 on the 20-80 scouting scale. Andrelton was clocked at 98 mph off the mound when he was in junior college in 2010. In 2014, NL managers named Simmons as having the best infield arm in the league, via a Baseball America survey. He makes all the plays and has excellent range, covering a lot of ground. He makes plays from deep in the hole look routine. Simmons has a tremendous understanding of the game. Andrelton has outstanding hands. Some of the plays he makes are just plain freakish. He has the quickness, instincts, and range to fill highlight shows. Braves third baseman Chris Johnson said, "Simmons is the best shortstop I've ever seen." When asked to provide the best defensive play he has seen Andrelton Simmons make, Braves manager Fredi Gonzalez has often said, "the next one." Get Andrelton on the field and he can turn his body and do things because his core strength is incredible. When he dives, when he hops up to his feet, he's not using his hands to get up. That's not just athleticism, that is core strength. Simmons says his amazing ability to retrieve every ball off every bad hop comes from the thousands of hours he put in taking ground balls on the pebble-strewn dirt fields in Curacao. His knees are covered with scars from all the dives and tumbles he took growing up. "There was never such a thing as a good bounce," Simmons says. "You had to react to bad bounces constantly. It was good to learn how to use one hand. To generate power, Simmons throws overhand, which is unusual for a shortstop. Andrelton began long-tossing as a teenager; at 14, he was throwing balls as far as 300 feet. He still long-tosses about once a week, sometimes from foul pole to foul pole. His arm strength allows him to play deeper at short and get longer looks at balls, often when the Braves play the infield in, they let Simmons play at his regular depth. In 2013, Simmons was named the Rawlings Gold Glove winner at shortstop. And while it might be difficult to determine which of Simmons' jaw-dropping gems has been his best, it is quite difficult to argue against the widespread belief that he currently stands as baseball's premier defensive shortstop. Andrelton became the first shortstop in Braves franchise history to win a Gold Glove. The last Braves infielder to win a Gold Glove was Terry Pendleton, who captured the award while playing third base for Atlanta in 1992. Pendleton, now Atlanta's first-base coach, spent the early portion of his career playing alongside the great Ozzie Smith. Rawlings used a committee of experts in baseball analytics and defensive measurement in 2013. The group devised the SABR Defensive Index, which draws on and aggregates two types of existing defensive metrics: those derived from batted-ball, location-based data, and those collected from play-by-play accounts. The three metrics representing batted-ball data include defensive runs saved (from Baseball Info Solutions), ultimate zone rating (developed by sabermetician Mitchel Lichtman), and runs effectively defended (created by SABR's Chris Dial). The 41 defensive runs saved credited to Simmons this year stands as the highest total recorded by a shortstop since the metric was first used in 2003. Adam Everett previously owned the record with the 36 DRS he recorded in 2006. No other Major League shortstop had a DRS greater than 12 in 2013. In 2014, Simmons was named the best defensive shortstop in baseball, winning the annual Fielding Bible award. In 2014, Simmons received his second Gold Glove award as the best shortstop in the NL. In 2017, Andrelton won the Gold Glove at shortstop—this time in the American League. In 2018, Simmons continued to dazzle with his incredible range and acrobatic plays at shortstop in 2018, earning his fourth career Gold Glove Award. He easily outpaced his AL counterparts in defensive runs saved with 21, seven more than the Indians' Francisco Lindor. On the outside of Simmons' glove are two words stitched into the leather: “God Given.” Andrelton does things defensively that few who’ve played the game have done as well. Based on measuring defensive runs saved, no player has equaled Simmons since the statistic came into use in 2003. He had an estimated 41 defensive runs saved this season, six above the previous record by Yankees outfielder Brett Gardner in 2010. Simmons’ 5.4 defensive WAR matched infielder Terry Turner’s score with the 1906 Cleveland Naps as the highest ever calculated, according to Baseball-Reference.com. Simmons has an uncanny ability to sense where a ball will be before it’s hit there. Simmons has churned out a lengthy catalog of mind-blowing plays, making him a fixture on highlight segments. But big leaguers will tell you the foundation for an elite defensive player is first making the routine plays. Simmons does. Terry Pendleton came up in the Cardinals system and played from 1984-90 alongside Smith, aka “The Wizard of Oz.” He sees a lot of Smith in Simmons. “They can change a game with their glove,” Pendleton said. “There are other shortstops that can do that, but their instincts and the way (Smith and Simmons) go about doing things and the way they think the game—they’ll do things instinctively that others won’t. But I keep reiterating to everybody, this kid has a year in the big leagues, and Ozzie did it for 20. Simmons and Mizuno USA, agreed on a multi-year partnership in March 2014. Andrelton brings yet another high-caliber shortstop to Mizuno's growing roster of professional athlete ambassadors choosing to play with Mizuno. This select group of shortstops includes Jimmy Rollins of the Philadelphia Phillies, Ian Desmond of the Washington Nationals, and Jose Iglesias of the Detroit Tigers. Simmons prefers to think more about defense. "He takes so much pride in defensive stuff. It's nice to see," said Braves manager Fredi Gonzalez. "He loves defense." While he can be scary with the way he wields the glove, throws darts from almost every conceivable angle, and tracks down balls with almost inconceivable range, he actually scares his manager more with his ferocity upon returning to the dugout following a play he does not make. "You always see players stamp offensively. You know, they leave the bases loaded, they stamp, they go in there and they throw helmets and break stuff," Gonzalez said. "I've seen him get so upset because he felt like he didn't make a play defensively almost to the same extent that you have to go in there and calm him down because he's going to hurt himself. That's how much pride he takes." Simmons warns against becoming too muscle-bound, however, lest a shortstop lose mobility. So instead of focusing solely on weight training, he swims regularly in the offseason to give himself a cardio and strength workout. Plus, back home in Curacao, he engages in a type of cross-training with fellow big league middle infielders Jurickson Profar (Rangers) and Jonathan Schoop (Orioles). 2018: Simmons won his fifth Wilson Defensive Player of the Year Award at SS, the most at any position since the award was established in 2012. 2018: Simmons was a Fielding Bible Award winner. It was his sixth. Andrelton is not a burner, but he makes the most of his speed and steals a few bases. He has good instincts on the bases. And he is honing his skills on the bases. Simmons is an aggressive base-runner and base-thief. But, Andrelton has trouble sliding into second base. Some big leaguers just have a mind-barrier and have trouble sliding into a base. In 2015, it seemed as if Simmons had that bug. In his first three big league seasons, he got caught stealing as often as he successfully stole a bag. But in 2016 with the Angels, he stole 10 bags while getting caught only once. And he followed that up with good success rates in 2017 and 2018. Spring 2010: Simmons missed a month of action with a broken toe. July 8-September 10, 2012: Andrelton fractured the fifth metacarpal in his right hand (right pinkie finger) during a game in Philadelphia. The injury appeared to occur in the fourth inning, when Simmons extended a routine single into a double and dived head first into second base. He had a cast on for four weeks. February 26, 2015: Simmons suffered a slight left oblique strain. He downplayed the strain, saying it felt like nothing more than a small cramp. But it was similar to an injury that kept him from breaking camp with the team three years before, in the spring of 2012. May 9-June 15, 2016: Simmons rolled on top of his thumb while sprawling to his right to snare a hard grounder off the bat of Evan Longoria in a game against the Rays. He immediately came out of the game. An MRI revealed a full thickness tear of the ulnar collateral ligament of his left thumb that would require surgery. June 6-16, 2018: Simmons was on the DL with a strained right ankle.